Vitamin D comes from the synthesis of UVB radiation, which is less than 5% of the sunshine. Depending on the time of day and time of year, there may not be enough UVB to produce vitamin D. The UVB strength is dependent on your latitude, and thus all cities in the same latitude have similar UVB exposure (barring pollution or fog). 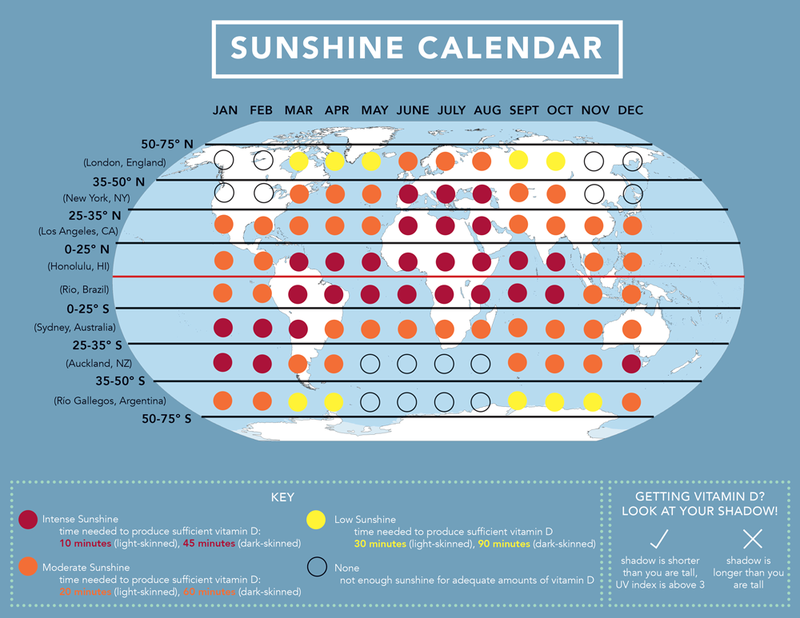 The map and calendar below can help determine which months you can get vitamin D from the sun where you live. Find your location; which latitude lines are you within? 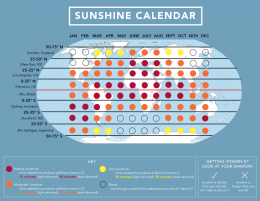 Read across from January to December to see what months you are able to produce vitamin D. Red dots mean good UVB availability, Orange is moderate availability, Yellow is low, and Clear is non-existent. Also, remember that you need to be out in prime hours, 10 am – 2 pm, or when your shadow is shorter than you.